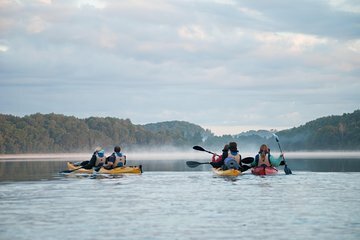 Combinez le temps passé dans la nature avec une leçon d'histoire lors de cette excursion d'une demi-journée en kayak à Trakai. Avec un petit groupe de 15 voyageurs ou moins, dirigez-vous dans le lac pour voir le manoir Užutrakis, le château de l'île et d'autres paysages au bord du lac depuis votre bateau. Écoutez des commentaires guidés sur la flore, la faune et l’histoire de la région. Avec tout l'équipement et les instructions fournis, cette visite est sûre et confortable, même pour les débutants. We really enjoyed the trip. The guide was superb and the weather was great, which always helps. However, we felt it was slightly too long for inexperienced people and would have been happy with the 4 hour trip instead of the 5. My mother and I had a wonderful time with our guide Tomas on our tour through the lakes around Trakai. It was our first time using a sea-type kayak with the rudder, but he was very patient with us, haha. The weather got a little chilly when the clouds came out, but we still had a nice picnic lunch at a small island campsite. He brought kibinai pastries and an apple dessert from a local shop that were very tasty. Tomas also took quite a few pictures with his waterproof camera and emailed them to us several days after the trip. I would highly recommend this tour!